Interested in all homes for sale in the neighborhood? Click the button on the right. 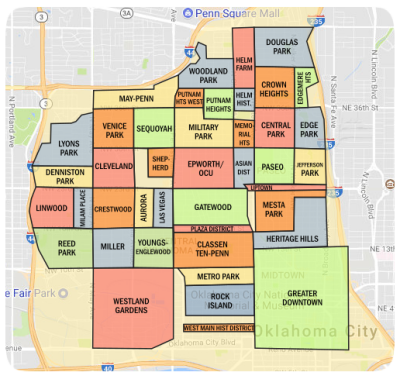 To the north of Oklahoma City proper lies the wonderful suburban community of Edmond, OK. For several decades, homebuyers interested in the best suburban environment near Oklahoma City have been drawn to this northern satellite city. With an engaging environment and a welcoming community, Edmond has fashioned itself into a premier suburban city. The precipitous rise in Edmond’s population has spurred the development of some truly wonderful master-planned communities that make life in this city an absolute pleasure. One such community is the highly-regarded Oak Tree neighborhood, which is attached to the popular Oak Tree Country Club. The Oak Tree, Edmond, OK houses for sale offer a unique blend of sophistication, luxury, and a beautiful setting for interested homebuyers. Located near the intersection of Kelly Avenue and Waterloo Road is the Oak Tree Country Club, a premier 36-hole residential golf course with outstanding golf course homes. As the top residential golf course in the state of Oklahoma—a title bestowed by Golfweek Magazine—Oak Tree Country Club offers an ideal setting for the Oak Tree community. Though Oak Tree itself enjoys its status as an established leader among Edmond’s master-planned communities, new homes are nevertheless still being constructed in the community. New home lots are currently for sale in several Oak Tree neighborhoods, including The Summit II and The Legacy. Residents of the country club’s homes enjoy numerous amenities, including foremost access to the country club’s facilities. Other conveniences include gated entrances that are guarded around the clock, security services for residents who are away from home, a system of multiuse trails, a fitness center, indoor and outdoor tennis facilities, an indoor track for joggers and walkers, courts for basketball and racquetball, an Olympic-sized pool and a children’s swimming pool, a playground, babysitting services, saunas, a spa, fine and casual dining at the clubhouse, and more. Thanks in large part to these amenities, the real estate property in Oak Tree, Edmond, OK has been regarded as some of the finest in the region for two decades. Although residents of Oak Tree have plenty of things to love about life at home and at the community’s wonderful amenities, there is also plenty to be excited about in the wider Edmond and Oklahoma City region. Edmond has earned its reputation as a first-class residential city in part due to its wonderful city amenities and services, such as great schools, libraries, recreational facilities, and the selection of other golf courses. 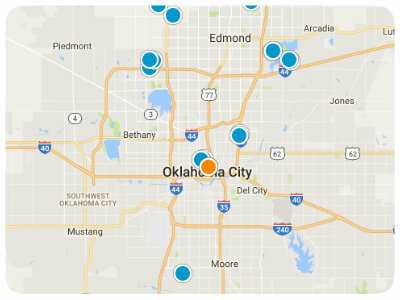 Just to the south, Oklahoma City offers a variety of cultural attractions that Oak Tree’s residents can easily visit. Among the better-known attractions are the Oklahoma City Zoo, the Oklahoma City National Memorial and Museum, the Civic Center Music Hall, the Stage Center, the National Cowboy and Western Heritage Museum, the American Indian Cultural Center and Museum, the Oklahoma City Museum of Art, the Gaylord – Pickens Oklahoma Heritage Museum, the Omniplex Science Museum, and the Oklahoma History Center. When it is time to shop, residents of Oak Tree can choose from the many modern retail developments close to home in Edmond, or to venture to Oklahoma City’s Bricktown district. Besides storefronts and plenty of great restaurants, the Bricktown area is also home to multiple sports venues, where residents can watch minor league baseball or hockey, or Oklahoma City’s NBA team, the Thunder. Edmond is also a great home to any residents that enjoy outdoor recreation, as well. For example, there are lakes and reservoirs strewn throughout the region that are used for recreation, two of the most popular being Lake Stanley Draper and Thunderbird Lake. The shores of these lakes are also home to trails and campsites that are popular among hikers and backpackers.